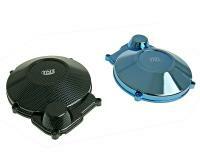 These TNT ignition covers offer another aesthetically pleasing add-on for all Minarelli AM6 engines. Known in the US for being the engine on the Aprilia RS 50 these cool colorful upgrades are easy to replace on any Aprilia RS 50 or MH RX50 Motorcycle engine. Processing quality and fit are up to TNTs usual excellent standards. Supplied with gasket.